PALMDALE – Volunteers working on the inaugural Making Strides against Breast Cancer, Antelope Valley, will host a kick-off rally tomorrow. 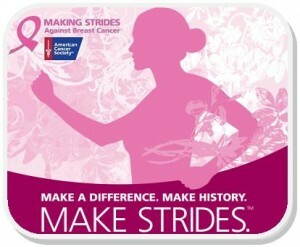 Residents are invited to attend to learn more about Making Strides and how they can take part. The kick-off rally starts at 8 a.m., Wednesday, August 21 at the Embassy Suites, located at 39375 5th Street West in Palmdale. The rally launches Antelope Valley’s inaugural Strides against Breast Cancer 5K noncompetitive walk scheduled for Saturday, October 19th at the Palmdale Amphitheatre. Teams of walkers will complete a 5K course and take part in activities before and after the walk. Read more about Making Strides Against Breast Cancer here. “Through campaigns such as these, we are working together as a community to combat the high statistics of breast cancer in the Antelope Valley,” said Star Moffatt, owner, Law Offices of Jeffrey D. Moffatt-Moffatt Law Firm in Lancaster, who recently presented the American Cancer Society with a $5,000 sponsorship check, solidifying the company’s support as the first flagship sponsor for the inaugural Making Strides against Breast Cancer, Antelope Valley event. Local leaders scheduled to attend Wednesday’s kick-off rally include Lancaster Mayor Emeritus Bishop Henry Hearns; Laura Bettencourt, Palmdale Councilwoman; Sandra Johnson, Lancaster Councilwoman and CEO of University of Antelope Valley; Vicki Medina, Executive Director of the Antelope Valley Board of Trade; Ingrid Chapman, President of Chapman Communications and a representative from Assemblyman Steve Fox’s Office. The American Cancer Society is joined by a host of sponsors who have taken a leadership position in the community’s fight against breast cancer, including Antelope Valley Chevrolet, Blue Shield of California, Walgreens, Waxie Sanitary Supply, Wells Fargo Bank, Antelope Valley Hospital, Antelope Valley City of Hope, and others. The American Cancer Society uses funds raised through Making Strides to fund research leading to the discovery of life-saving treatments, advocate for women to have access to mammograms and treatments, and to provide free programs and services that improve the quality of life for cancer patients and their families. For more information about the Antelope Valley Making Strides event, or to volunteer, call event chair, Ima Moore at 661-305-5222 or contact emooreno4@msn.com. To learn more about the American Cancer Society, call 1-800-227-2345 or visit www.cancer.org. 1 comment for "Kick-off rally tomorrow for ‘Making Strides against Breast Cancer’"
I tried to send an email to the email address provided and it was returned back to me as undeliverable. Can someone please check the email address?